Along with powerful, actionable customer experience insights and a customer-centric culture, it’s almost impossible to have customer commitment and advocacy behavior without employees both understanding their role as customer experience stakeholders and living that role as value delivery agents and supplier advocates. We call them employee ambassadors. The service-profit chain postulated that employee satisfaction drives customer satisfaction. Today’s demanding and continuously changing customer environment requires tools for better understanding of both customer behavioral drivers and drivers of employee attitude and action that extend well beyond conventional-wisdom communication and satisfaction feedback approaches. Traditional best practices in these areas need to be significantly redefined. This was actively addressed in Market Probe’s recent series of brand and advocacy behavior webinars. Employees are key stakeholders in value delivery and brand/supplier success, and they frequently represent the difference between positive experiences or negative experiences and whether customers stay or go. Is employee satisfaction the best vehicle for creating customer loyalty? Industrial psychologists and organizational behaviorists have been studying employee satisfaction for over 30 years, assuming that the level of staff satisfaction correlates with impact on performance. However, as one major study concluded: “Researchers have been unable to confirm a relationship between employee satisfaction and business performance.” This is almost identical to the oft-proven determination that a high level of customer satisfaction has relatively little bearing on loyalty behavior. Conversely, transactional dissatisfaction can—and often does—undermine customer loyalty and advocacy. Employees are at least as important as other elements and contributors to effective customer management in optimizing benefits for customers. Study findings such as this have demonstrated that employees contribute to customer behaviors representing both disappointment and delight, and all intermediate behaviors as well. Beyond just understanding employee satisfaction and what employees value and desire in their jobs, it is essential that companies have a research and analysis protocol which definitively connects staff performance and engagement directly to customer marketplace behavior so that they can hire, train, recognize and reward employees for how, strategically and tactically, they contribute to customer value. As shown above, there is an amply proven, powerful relationship between employee commitment to the company, the brand value proposition, and the customer and their employers’ actual business outcomes. Northwestern University conducted a hotel chain study which showed that, for “The extent to which employees try to satisfy customers,” a 10% increase in this factor resulted in a 22% increase in customer spending per hotel visit. 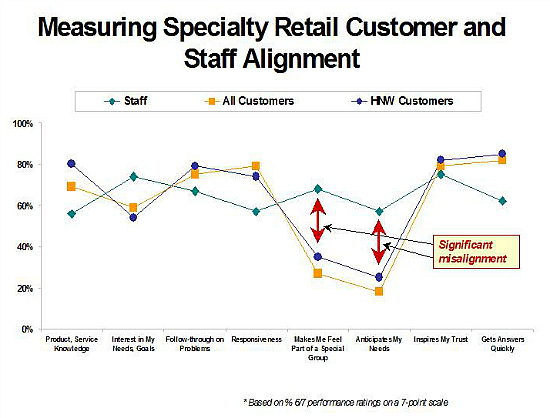 In the 1990s, Sears conducted a widely-reported study in 800 stores which showed that a 5% documented improvement in employee attitudes toward their jobs and commitment to the company directly resulted in a 1.3% increase in customer perceptions toward the retailer and, in turn, a .5% increase year-over-year revenue. Research by the Royal Bank of Canada has determined that the level of employee commitment accounts for 60% to 80% of bank perception by customers; and 40% of the difference in how customers view RBC’s services can be linked directly to their relationship with bank staff. Yet, when considering, and measuring, the pivotal elements of staff performance and productivity, most companies are focused principally on employee attitudes around satisfaction, company loyalty, alignment with goals and objectives (such as corporate citizenship), and levels of engagement. 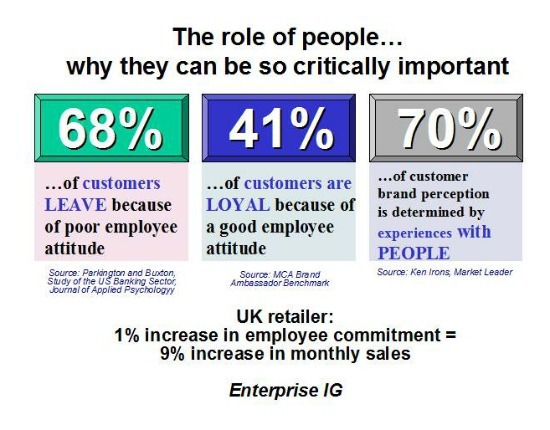 These are important, to be sure; but historically they only superficially and incidentally correlate what employees think and do to customer behavior. Employee advocacy, in the form of ambassadorship, has become a major focus of many organizations, as they have come to realize the financial and cultural consequences of a workforce that is committed to the overarching goal of optimizing customer loyalty and advocacy behavior. Most employee research has traditionally been conducted as a means of identifying levels of staff satisfaction and performance, perceived values, and engagement with company missions and culture. But there is also growing recognition of the need to relate and link employee perceptions, beliefs and behaviors to company business outcome-based missions and strategies. Just as customers who actively express their commitment to a supplier can range from strongly positive (advocates) to strongly negative (saboteurs), employees can significantly impact customer commitment behavior toward their employer through attitudes and actions on behalf of the company and customer. As with customers, these attitudes and actions range from highly positive to highly negative. It is important to define the most active level of employee commitment to the company’s value promise, to the company itself, and to optimizing the customer experience. While linked to—but distinctive from—the productivity and empowerment elements of employee satisfaction, engagement, and alignment research, here, the emphasis is on strengthening bonds with customers, and creating positive transactional and long-term customer experience through employee interaction. We most typically concentrate on what drives active, positive, vocal stakeholder commitment—in other words, advocacy. However, it is at least equally important to identify where employee indifference and negativism—potentially leading to alienation and sabotage attitudes and actions—exist, why they exist, and how they can be mitigated or eliminated. Like commitment for customers, advocacy is a fairly new term in understanding employee behavior, and there’s not a great deal of academic literature on it (and none from professional employee research sources). But it’s quickly becoming more actively used. …many studies have determined that customers who complain to an organization and have their complaints satisfactorily resolved tell an average of five other people about the good treatment they received. At the high end of commitment are employee advocates, or ambassadors. Advocates represent employees who are strongly committed to the company’s brand promise, the organization itself, and its customers. They actively behave and communicate in a consistently positive manner about the company, both internally (to co-workers and customers) and externally (to family, friends, and others). At the low end of commitment are employee detractors and saboteurs. These individuals are negative advocates, the ‘bad apples,’ who collect a paycheck but don’t hesitate to communicate their low opinions and unfavorable perspectives both to peers and to customers and others outside the company. Polar employee positivism is the essence of advocacy—and it is absolutely critical for companies striving to be optimally customer-centric. Customer experience management processes can be tightly managed, but executing and sustaining them is virtually impossible without the genuine and enthusiastic support of employees. These experiences, and resulting levels of customer loyalty behavior, are greatly influenced by employee interactions. For example, many studies have determined that customers who complain to an organization and have their complaints satisfactorily resolved tell an average of five other people about the good treatment they received. If they receive poor treatment, they tell at least 20 people. Many of these studies were conducted pre-Internet era, so the potential for negative informal communication (blogs, forums, chat rooms, online communities, rating sites, etc.) is even stronger in today’s connected world. Service studies have also shown that, of the customers who register a complaint, between 54% and 70% will do business with the organization again if their complaints are resolved. This figure rises to 95% if the customers feel the complaints are resolved professionally, quickly and proactively, depending upon positive employee attitudes and actions as well as the systems in place to manage complaints. So, it is both culturally desirable and financially rewarding for organizations to foster employee positivism. Years ago, quality guru W. Edwards Deming said that each person in a company has one of two major functions: They either serve the customer or serve someone who does. So, it’s clear that understanding where perceptual gaps between employees and customers exist should be of prime importance, in efforts to optimize the effectiveness of employees in terms of productivity and delivering value to customers. As a stakeholder research organization, we’ve frequently found that customers consider the emotional, relationship-based aspects of value delivery—trust, communication, interactive/collaborative components of service, anticipation of needs, brand equity, etc.—much more important, and more leveraging of behavior, than the functional aspects. Customers tend to see the functional aspects of delivery as more basic and expected, in other words one-dimensional table stakes and non-differentiating among suppliers. For key interaction and touchpoints between customers and suppliers, the level of true focus and centricity can be identified quite easily. We have long supported the concept of “mirroring,” that is including at least one cell of supplier staff—from Field Sales, Marketing, and especially Customer Service—in every customer loyalty study done for our clients. The results are frequently eye-opening. We simply ask employees to answer the same questions asked of customers, in the way they believe customers will rate and evaluate them as a supplier. When companies are innovative and inclusive with staff, all parties benefit. The company gets more effective employees. Employees like the participation and learning. Customers like the improved processes and interactions. Another key advantage of conducting employee “mirror” research, and one not to be overlooked, is that, in all likelihood, competitors don’t have this kind of insight. They’re hearing only from the external constituent group, the customers, but not from the equally important internal representatives and deliverers of value, company employees. Increasingly, we are beginning to understand, and even predict the effect on customer commitment and advocacy behavior, of employees as proactive company ambassadors and positive agents (or also agents of supplier distrust and customer turnover, if the individual or longitudinal experiences have been poor). This is a “holy grail” for many organizations as they strive to leverage human capital to best effect. As Fortune Magazine columnist Thomas Stewart has said, “Human beings want to pledge allegiance to something. The desire to belong is a foundation value, underlying all others.” When that “something” is the optimization of customer experiences and loyalty behavior, coupled with the highest levels of employee participation and investment in reaching that goal, everybody wins. Very good and informative. Just wondering where these percentages are from, can you give the name of the source? Sources are multiple. They include service study findings generated by Forrester, RightNow, TARP, and several other consulting and research organizations. These results follow similar patterns and have been validated, in many b2b and b2c panel tracking studies for individual clients around the world. There is, as you’d expect, some cultural variation country to country; but, that said, reported findings hold up remarkably well irrespective of location. What an exceptional, comprehensive post! In an independent study we conducted last summer we found another data point that would fit well into this list. Employees who report that their companies implement customer-centric strategies; employees are 2 to 2.5 times more likely to report that they intend to keep working for their employer, that their work inspires them to go above and beyond for customers, that they recommend their employer and that they are truly passionate about their work. Thanks very much for your comment. Customer centric companies invariably have (and keep) employees who are invested and enthusiastic about optimizing customer experiences, whether they are front line staff or not. I read the article you referenced. I’d tend to agree that engaged employees are more loyal to the organization; but, in my studies I’ve found that there is only incidental correlation between employee engagement and customer advocacy. Employee advocacy is a different concept. –	how aligned they are with the company's goals and culture. Engagement seeks to quantify emotional and rational job satisfaction and motivation to think, feel, and act. This combination is extremely important for training, communication, staff management, and individual and group goal-setting. Engagement, however, represents a mÉlange of loosely related concepts. In 2006, The Conference Board published “Employee Engagement, A Review of Current Research and Its Implications”. According to this report, twelve major studies on employee engagement had been published over the prior four years by top research firms. Each of the studies used different definitions and, collectively, came up with 26 key drivers of engagement. For example, some studies emphasized the underlying cognitive issues, others on the underlying emotional issues. The Conference Board looked across this compilation of data and constructed both a blended definition and key themes that crossed all of the studies. They identify employee engagement as “a heightened emotional connection that an employee feels for his or her organization, that influences him or her to exert greater discretionary effort to his or her work”. Many of the studies agreed on eight key drivers. – Trust and integrity – how well managers communicate and ‘walk the talk’. – Nature of the job –Is it mentally stimulating day-to-day? – Line of sight between employee performance and company performance – Do employees understand how their work contributes to the company’s performance? – Career Growth opportunities –Are there future opportunities for growth? – Pride about the company – How much self-esteem do the employees feel by being associated with their company? – Employee development – Is the company making an effort to develop the employee’s skills? I think the “alignment with company goals and culture” is a great piece in the “engagement puzzle.” Is there a link you can share to the full paper? I would be interested in reading it in full.